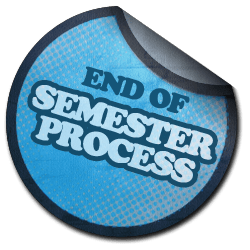 At the end of each semester, instructors teaching within Blackboard must perform a series of tasks called the “End of the Semester Process”. This process is helpful for preserving a full record of an instructor’s Blackboard course content, Grade Center, and student work in an archive file. It is the instructor’s responsibility to archive each of their courses so that content can be accessed at a later date! Blackboard will be unavailable to faculty and students on Dec. 23rd at 5PM CST and will remain unavailable until the week of January 6th, 2014. Inside your course, scroll down to the Control Panel. Expand the Grade Center menu and click Full Grade Center. Once the Grade Center loads, select Work Offline at the top right of the Grade Center spreadsheet. Select Download from the Work Offline menu. You will be taken to the Download Grades page. Leave all of the default choices set. Press Submit to download your Grade Center. A screen will appear with a Download link. Click this link to save your Grade Center as an Excel file. A File Download window will appear. Choose Save to save the file to your computer. When the Browse window appears, locate the folder on your computer (or I-Drive) to save the file to. Press Save to start the download. When done, please proceed to the Step 2. Inside your course, scroll down to your course’s Control Panel. In the Control Panel, click the double arrows to expand the Customization menu. In the Set Availability option (#3), select Unavailable to remove student access to the course. When done, please proceed to Step 3. A personal master is a Blackboard course shell created specifically for you and the course you request. A personal master is your very own course shell to keep course documents between semesters or as your own personal archive of course information. It is never deleted and serves as a master copy of your course. If you would like to request a Personal Master, please complete the Online Form Request. Skip this step if you already have a Personal Master for the course that has just ended. Proceed to Step 4. Archiving the course compresses all course files into a .ZIP file. This file can be later imported into your Personal Master for editing between semesters or your live course shell for display to your students. This is an important step to save your course content and repurpose it at a later time. In your course, scroll down to the Control Panel. In the Control Panel, expand the Package and Utilities menu. Select Export/Archive Course and then select the Archive button. The next screen will ask you if you would like to include your Grade Center history. It is recommended that you select Yes. Next, select Submit. You will receive a notification on the next screen that says: “Success – This action has been queued. An email will be sent when the process is complete”. After you receive the email from Blackboard telling you that your archive is complete, come back to the Archive screen (Packages and Utilities > Export/Archive Course > Archive). You should now see a link to your archived course. You need to save this file. To do so, Right-Click your mouse on the link and select Save Target As. A Window will appear. Choose the location where you want to save your archive file and press Save. When you have successfully archived and saved your course to your computer or storage media, proceed to Step 5. Inside your old Personal Master, scroll down to the Control Panel. In the Control Panel, select Packages and Utilities. On the Bulk Delete page, Check all checkboxes EXCEPT for “Users”. In the Confirmation field, type “Delete” (without quotation marks). Blackboard will remove all content from your Personal Master. Once this process is complete you will only see empty Content Areas (course menu buttons). Delete all of your buttons, except for Home or Announcements, by clicking the down arrow next to each button and selecting Delete from the pop-up menu that appears. When you have completed this step, proceed to Step 6. In the Personal Master, scroll down to the Control Panel. Within Packages and Utilities, select Import Package/View Logs. Click the Import Package button. On the Import Package page, click the Browse button to find you archive file on your computer. A File Upload box will appear. Select your .zip file and click the Open button. In the Select Course Materials section, select all the materials to include in the import process. Select the Submit button, at the lower right, to finish the import process. Depending on the file size of your course, this process may take several minutes. Once the import process is complete, you will receive an email from Blackboard. If you have any questions about these processes, contact the Blackboard Faculty Support team using our Contact Us Form.